Amway has lost its legal effort to stop the largest and potentially most damaging class action lawsuit ever brought against the multi-level marketing scheme from going forward. A federal judge has ruled that Amway's rules for settling disputes are "unconscionable" and unenforceable. He denied Amway's defense. The case will now proceed. 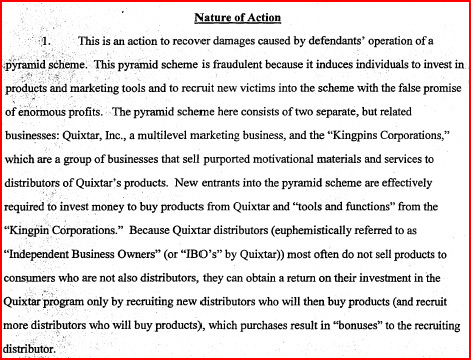 The class action lawsuit was filed in 2007 against Quixtar (Amway) charging that the company is running an illegal pyramid scheme. (filed in US District court in the northern district of California on January 10, 2007, case number 3:07-cv-00201-EMC.) Amway distributors charge that there is no retail "direct selling" opportunity, only an endless chain recruitment program. that the RoC requirement that an IBO engage in Informal and Formal Conciliation prior to arbitration is substantively unconscionable, and exceedingly so. The ADR deck could not possibly be stacked more in Quixtar's favor than it is here." The case was brought by one of America's most prominent law firms, Boies, Schiller and Flexner. David Boies of this firm represented Vice-President Al Gore in front of the US Supreme Court in the world famous case, Gore vs. Bush that contested the vote counting in Florida after the 2000 election. The other firm partnering with Boies, Schiller & Flexner in the suit is Gary, Williams, Parenti, Finney, Lewis, McManus, Watson, & Sperando, P.L.. in Stuart, Florida. This firm has a powerful track record of successful class action suits against large companies. Amway delayed the case for nearly a year by claiming that the distributors could not bring a class action suit because they had to submit to Amway's "conciliation" and "binding arbitration" process. Amway distributors sign an agreement  often without realizing the consequences  that includes Amway's system for settling disputes. The distributor charged that the Amway system was unfair and that many distributors had no understanding of what they were signing. The Amway system has also been responsible for "muzzling" former distributors who raised issues of fraud, deception, and financial losses. IN the class action case, all such evidence will now get a pubic airing. The suit is based on the very same charges that the Federal Trade Commission has brought against Equinox, SkyBiz and other MLMs that regulators shut down. The suit charges that the Quixtar program  based upon selling products to recruits "for personal use", then authorizing them to recruit others to do the same while requiring or incentivizing them to maintain quota levels of monthly purchases, and then rewarding them in a multi-level compensation system  is a fraud. The suit also attacks Quixtar's infamous "tools" business as a second pyramid scheme perpetrated on new recruits. The "tools" scheme was exposed in a 2004 special report on NBC Dateline. Using Quixtar's own payout data a report published by Pyramid Scheme Alert has shown that 99% of all Quixtar recruits never earn any profit. In the report, "The Myth of MLM Income Opportunity," the 99% loss rate was shown to be caused by the pyramid recruitment model and the lack of retail sales, not the "failure" of the recruits. Regarding the charge that the "non-retailing" business plan that most Quixtar recruits engage in is a scam, the FTC has prosecuted other MLMs on these grounds. FTC declarations have stated that if the majority of the money used to pay the "upliners" is gained primarily from the purchases of the downliners  not from their retail customers  the payments are de facto payments for recruiting. In such cases, the "business opportunity" is not to sell the MLM products but to recruit others into the "business opportunity" in an endless chain. Endless chains are considered "inherent frauds" since they cannot deliver on their promise of income to any but a few at the top; the vast majority are doomed from the start to financial losses; and the schemes must use deception to lure consumers into nearly certain financial losses. Pyramid Scheme Alert has asked the FTC to reopen the case that it previously brought against Amway in which the FTC had charged that Amway operated a pyramid scheme. An Administrative Law Judge in 1979 ruled that Amway could continue to operate in the US, based on Amway's claims that its business was primarily based on retail sales (sales by Amway sales people (IBOS) to actual end-user customers). Amway claimed that the business was not based on each salesperson making money from the investments of other salespersons.